The Man Who Stares At Screens: Save The Green Planet - or how the East saved horror. Save The Green Planet - or how the East saved horror. I discovered Save The Green Planet several years ago, it was a completely random selection from my online movie rental service and I had absolutely no idea what to expect. I'm not generally a fan of horror, especially not torture horror unless it is prefixed with comedy in big letters, Save The Green Planet is this and much more, in fact it's something of a genre buster. 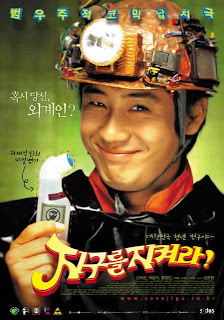 Released in 2003 and written and directed in Korea by Jang Jun-hwan it could be classified as a Comedy/Horror/Sci-Fi/Detective/Drama movie, though I'm still probably missing something out. It tells the story of the more than a little psychotic Byeong-gu and his besotted circus performing girlfriend Su-ni. Byeong-gu is convinced that the world is about to be invaded by aliens and with the help of Su-ni kidnaps a powerful company executive who he believes is really a high-ranking alien official who will be able help him contact the alien prince at the next lunar eclipse and stop the imminent invasion. Believing that only he can save the world he imprisons the executive in his basement and begins to torture him for information on the alien threat. As the torture progresses it becomes evident that Byeong-gu's ravings about alien invasion may hide much deeper seated reasons for kidnapping and torturing this particular individual. Meanwhile the police are under a great deal of pressure to find the missing man, who is the son in law of the chief of the force. Sometimes a film comes along that reminds you why you fell in love with cinema in the first place and Save The Green Planet is one of them. It's an absolute joy from start to finish, brilliantly written and acted, constantly inventive and unpredictable moving seamlessly from slapstick comedy to gruesome torture to moments of true tenderness with an assuredness that is all the more impressive when you learn that this is Jang Jun-hwan's directorial debut. The editing is superb with excellent pacing and lots of intriguing little animations and CGI snippets that really add to the sense of Byeong-gu's mental disorder. Having seen this film six or seven times since first coming across it it has lost none of it's charm and is still absolutely the first movie I recommend to anyone with any modicum of taste in movies. It is also the film that confirmed for me the suspicion that as far as horror movies go Hollywood should hang up it's gloves and leave it to those on the other side of the Pacific. Since the mid-nineties all the best most innovative horror movies have been coming out of Japan and more recently Korea, with the American film industry playing a poor game of catch up and I just cannot imagine modern Hollywood ever producing anything as original and imaginative as Save The Green Planet. Absolute top notch cinema, get yourself a copy and cherish it.